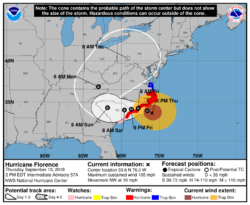 Prepare for Hurricane Florence - get a weather radio! This entry was posted on September 13, 2018 by Rick. Map courtesy National Hurricane Center. 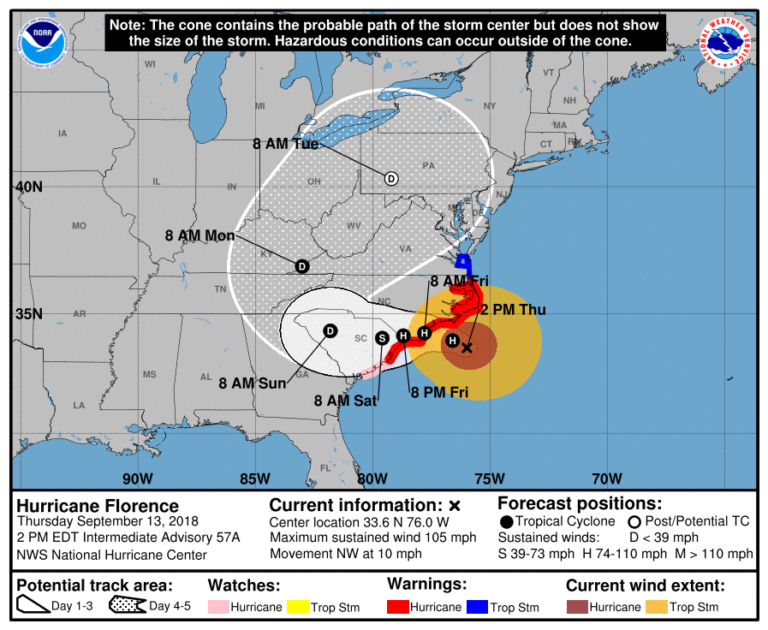 Hurricane Florence is bearing down on the East Coast of the US, and is expected to make landfall within the next 24 hours. For those on or near the coastline, personal preparation for this monster storm should already be at or near completion. For those who are further inland, there is still some time to prepare, but the storm is closing in. Are you ready? If you don't have an emergency preparedness kit, build one now. You can find the list of the 13 most essential items needed for an emergency kit on The Department of Homeland Security's web site at https://www.ready.gov/build-a-kit. You can also download a printable version of the FEMA emergency checklist in pdf format to print out and carry with you or post in a convenient location. Of course, one of three most important items on this list is a Battery-powered or hand crank radio and a NOAA Weather Radio with tone alert. All of our handheld FRS and GMRS radios are battery powered, and many also feature NOAA weather channels with emergency and weather alerts. One model, the Midland EX37VP, is a complete FRS radio emergency kit with a flashlight and emergency whistle - two other items on the DHS emergency preparedness list. Choosing this model checks off multiple items on your list. Some of our portable weather radios, such as the ER210 and ER310, are multi-function devices equipped with built-in SOS beacons/flashlights, digital clocks, USB charging adapters, and multiple power options. These weather radios include a dynamo hand crank as recommended in the DHS emergency list, and even solar power! Some of our NOAA approved desktop weather radios, such as the Midland WR400, are not only equipped with S.A.M.E. Digital Technology, but also include other features such an emergency battery backup. We also have a weather radio that does it all in one unit. The Midland XT511 Base Camp Two Way / Emergency Crank Radio has almost everything you need for emergency communications. It's a 22 channel GMRS two way radio with NOAA all hazards alert weather alert radio, AM/FM radio, alarm clock, built-in flashlight, emergency hand crank, both AC and DC adapters, USB charging port, and hand microphone. The alert override automatically switches to emergency weather alert broadcasts while you listen to the AM/FM radio. There are many models to choose from, and the features vary. Which emergency radio is best for you? Our Emergency Weather Radio Comparison Guide lists some of our models and puts them all on one simple chart so you can compare their key features fast. The guide is FREE to download and print for your personal use. To learn more about emergency weather radios, listen to The Two Way Radio Show Episode 13 - Emergency and Weather Radios.